Strum Acoustic Session emulates nylon- and steel-stringed guitars. 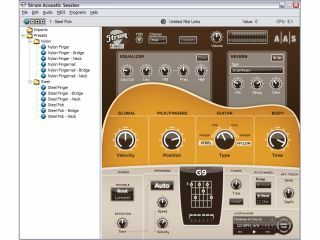 Applied Acoustics Systems' Strum Acoustic GS-1 does a pretty reasonable job of emulating an acoustic guitar in software, but if it's a little out of your price range, you now have the more affordable Session version to consider. This cutdown edition lacks some of its parent product's programmability, but is based on the same physical modelling engine. It emulates nylon and steel acoustic guitars and features a voicing module that automatically makes chords played on a keyboard sound like they were played on a guitar. There are various strumming and picking options (you can also trigger the instrument using MIDI loops), while EQ and reverb modules are included, too. Strum Acoustic Session is available now from the Applied Acoustics website for $99. It's Mac- and PC-compatible and supports the VST, Audio Units and RTAS plug-in formats.